In major Division 1 college football, it’s rare to see an athlete play both offense and defense. The reasons are quite simple: with a roster of more than 100 spots available on college football teams, players are able to become more specialized as depth increases. This allows players to get more in-depth training at a certain position, and helps prevent overuse, causing players injuries and fatigue. When the roster is limited because of injuries or NCAA sanctions, more players must step up to fill the need. Myles Jack stepped up to play both linebacker and running back last season for UCLA after a rash of injuries to the team’s other running backs. And brutal sanctions forced USC to use Adoree’ Jackson at both wide receiver and defensive back. Shaq Thompson also stepped up on both sides of the ball last year for Washington, a team desperately in need of offensive playmakers. 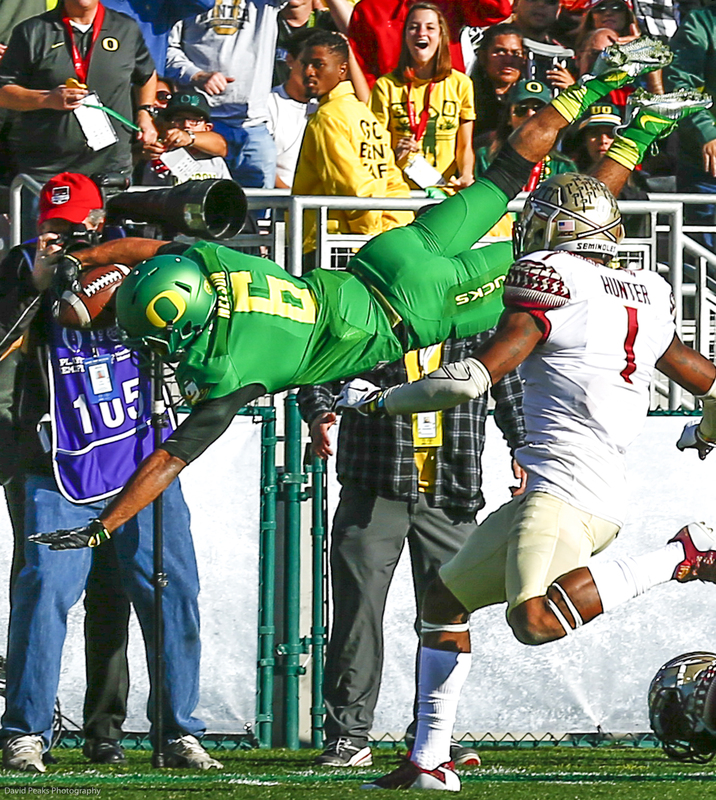 Last year Charles Nelson became an offensive standout. Now, he looks to dominate on defense, as well. What makes Oregon’s new star, Charles Nelson, unique is that, despite some losses of veteran players in the secondary, there is no need for the coaches to use him in a multitude of ways. 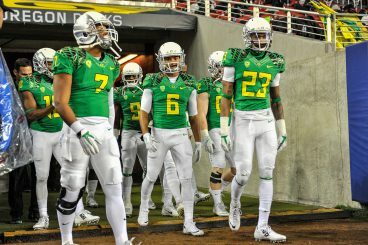 Oregon is not running out of DBs the same way UCLA lost all of its running backs to injury mid-season. Nor did Oregon face the crippling sanctions USC did when it was limited to fewer than 50 available players during parts of last season. What separates Nelson from his incredibly talented Pac-12 counterparts, is that there was no need for him to play both positions. Yes, the Ducks lost key veterans from their secondary after last season and, during the season, Nelson played more and more offense as the Ducks offensive starters began to fall like flies. But this year, they have one of the deepest receiving corps in the country, have recruited well in the secondary and have a number of young players ready to step into those roles. After watching Nelson play special teams last year, it was clear that he was a unique talent who could play on both sides of the football. In defensive situations such as kickoffs, he seemed to fly down the field and make some of the most memorable hits of the year. As a returner, he was one of the most electric players in college football, returning 11 punts for 171 yards and 2 touchdowns. Who doesn’t remember his epic punt return touchdown during the team’s trip to Cal? Upon watching Nelson on special teams and offense last season, the defensive coaches decided they couldn’t keep their hands off him during spring practices. Nelson said the shift to DB is a big change from his role on offense. Nelson enjoys the relationships he’s built with his teammates on both sides of the ball. Nelson appreciates the relationships he’s built with players from both sides of the ball. The versatile Nelson is not only a hot commodity on the football field, but also played a role in the national championship men’s track team, running in the 4 x 100 relay, a team that posted the third-fastest time in school history in the NCAA West regionals. He also participated in the long jump. 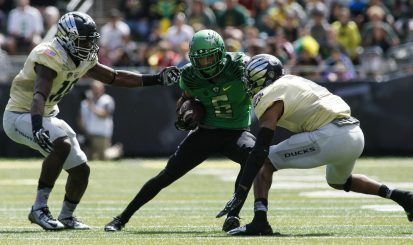 Nelson makes a move on two defenders during the Oregon spring game. The spring game was his first experience playing both offense and defense. Nelson excelled on both sides of the ball, catching 5 passes for 144 yards and 2 touchdowns, while adding an interception on defense. The question Nelson faces heading into next year is whether his body can hold up to all the extra playing time. Unlike Jackson and Myles, Nelson is a relatively small athlete, standing 5 feet, 8 inches and weighing just 170 pounds. Between special teams, offense and defense, Nelson could take a lot of extra pounding and face a ton of fatigue as the season wears on. It will be interesting to see how the coaching staff uses his abilities. Whatever the coaches decide, Nelson will be prepared. “I might be [busy], but I’m ready for it. We’ll see what happens,” he said. 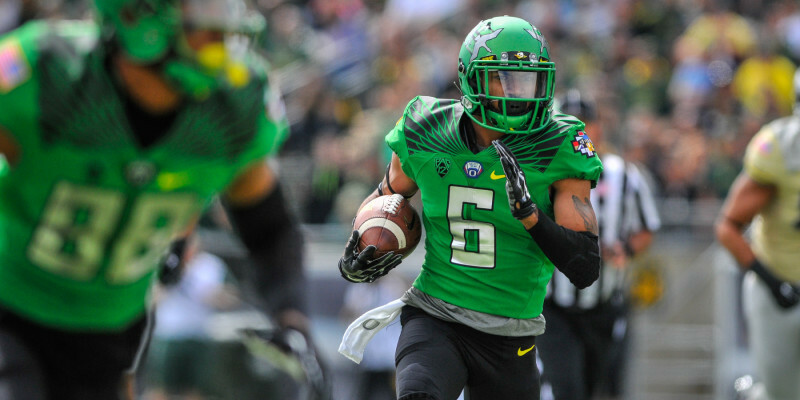 While the iron man athlete seems to be found relatively easily in the Pac-12, Charles Nelson is a rare breed of athletic talent and is set to be a force for Oregon with every snap in the games this fall.